The types of wildflowers available for the garden area is only limited by the imagination. As an added benefit, a wildflower garden provides hours of pleasure at minimal cost simply because these plants grow as advertised, easily in the wild. Adaptability, along with the good sense to produce flashy, four petal flowers, explains much of the success of plants in the Evening Primrose family (Onagraceae). Most at home in the temperate areas of North America, evening primrose species mark their presence along coastal areas, desert floors and mountain tops. Capturing the imagination of poets and botanists alike, many of the flowering plants are night bloomers, adapted to the pollination patterns of night insects such as moths. 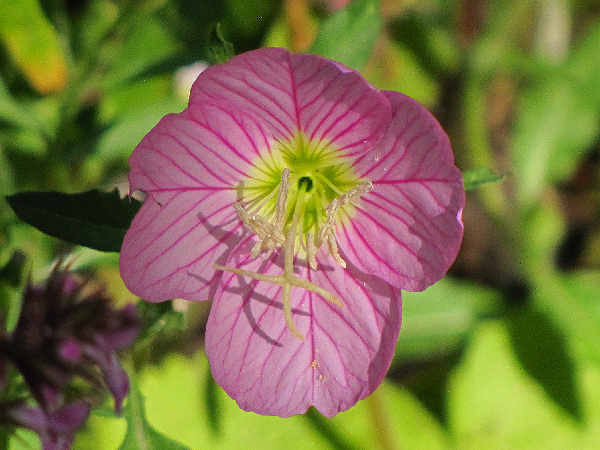 Many Evening Primrose species adapt easily to garden life. Pink Evening Primrose (Oenothera speciosa), for example, is one tough flower, easily grown in many poor soils. It’s a showy spring blooming plant found in the wild and in gardens throughout much of the southern tier of the United States. Mertensia, another genera in the forget-me-not family, go by the common name bluebells. Mertensias are a very adaptable genus of bluebells. Most of the twenty or so different identified North American species are associated with forest or riparian habitat. However a couple of species can be found in fields and wetlands, as well as lower and higher elevations. 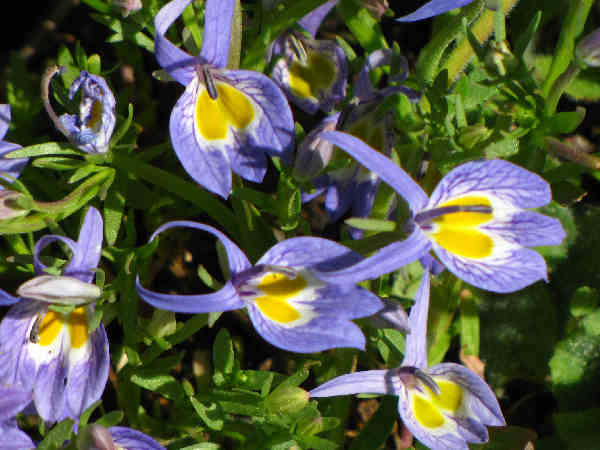 Their diversity translates into at least one species suited to gardens across the country. Size, habitat and leaves constitute the major differences among the plants. Small Bluebells (Mertensia longiflora) grow close to the ground in sagebrush and mountain areas of the Western United States and Western Canada. Tall Bluebells (Mertensia paniculata), can grow up to six feet, making them giants compared to many of the smaller ground growing bluebell species. 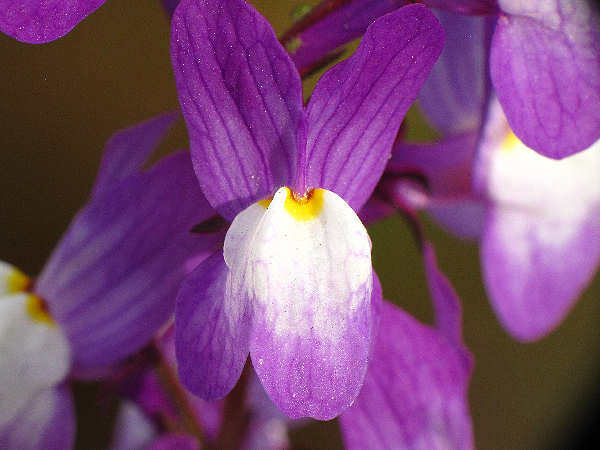 Thirteen different Calicoflower species (Downingia) grow with blue, purple and white shaded petals. Often found low to the ground in wetlands areas, they can provide a nice splash of blue to any garden. Seeds for the Elegant Calicoflower (top picture) (Downingia elegans), a fairly common plant in Western North America can be purchased at specialty seed shops. Bach’s Downingia or Bach’s calicoflower (Downingia bacigalupii) grows close to the ground, often in large mats, in wetlands areas in northern areas of the Western United States. 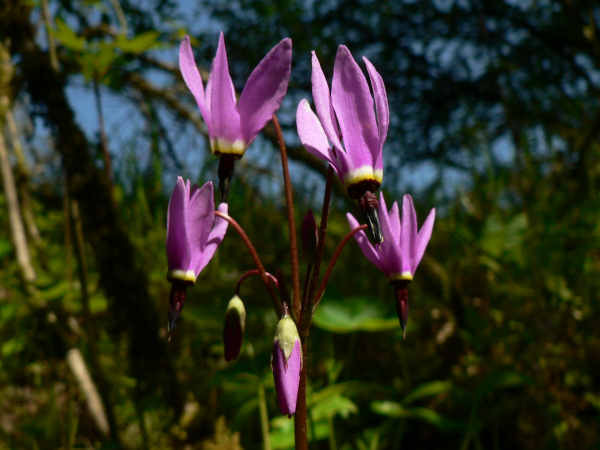 The fifteen native Dodecatheon species, better known as shooting stars, grow in a variety of habitats, including woodlands and meadows. Establishing them in the garden can be difficult. While the internet provides ready access to seeds, the seed germination can be complex, including a six week cold storage of the seeds to simulate the seed’s natural, winter dormant season. Select nurseries also provide seedlings. Once established in a garden, shooting stars tend to grow consistently year to year. Slight differences in petal color often serve as visual aides for field identification. Figworts or snapdragons (family Scrophulariaceae) quietly makes it way up the ranks of many favorite flowers lists. World wide, the family of annual and biennial herbaceous plants edged close to the three hundred genera and five thousand species ranges. The family’s large size provides a broad base for choosing favorites. Some choose the root parasites such as the Louseworts and Castilleja. Others prefer the small and colorful Veronica and Mimulus species for both ground cover and garden purposes. Modest in terms of total population size, Spiderworts (family Commelinaceae) still attract the gardener’s attention. Family diversity reaches its peak in tropical and subtropical areas of the world. Perhaps nine genera have been documented in North America. 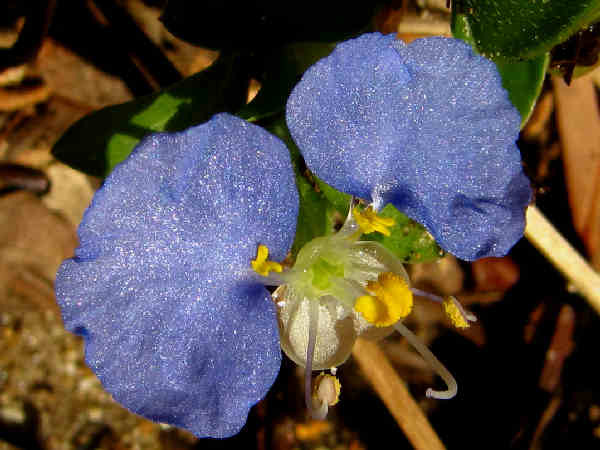 Southeastern states show the largest Commelinaceae diversity. A state such as Texas, for example, might have a couple dozen species divided among five genera. Regardless of the location, most people recognize spiderworts based on two genera, dayflowers (Commelina) and spiderworts (Tradescantia). Species from each of the genera grow hardily in the wild across the United States. Spiderworts also raise a fair it of enthusiasm among gardeners. When thinking spiderworts and dayflowers, think clumps of grass that sprout flowers. Discrete clusters of spiderworts and dayflowers can easily be managed in a garden setting by consisting trimming leaves and dividing the plant by the root system every few years. Spiderworts tropical and subtropical background suggests that the plants enjoy a sunny, moist environment. While most native species might be partially shade tolerant and adaptable to USDA zones from 4-9, sun and moisture enhance the plants flowering capacity. Depending on the source, waterleafs are either a family (Hydrophyllaceae) or a subfamily of flowering plants. Sixteen different waterleaf genera grow in North America, most of which share the physical characteristics of low growing, small blooming, seed producing annuals. 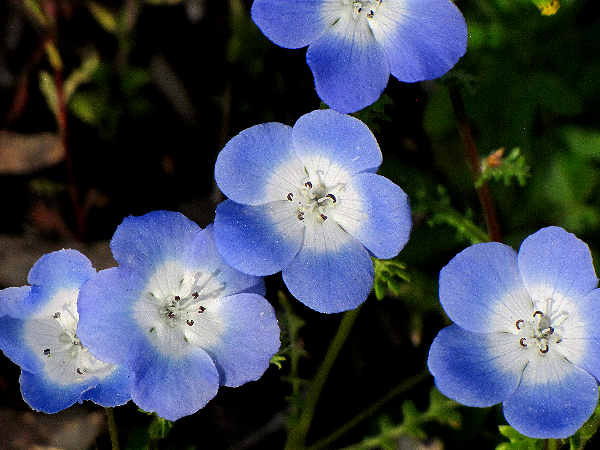 Baby Blue Eyes (genus Nemophila), rank among the most recognizable of all waterleaf species. Nine or ten native species grow in most areas of the U.S, excluding New England, the Northeast and the Midwest. 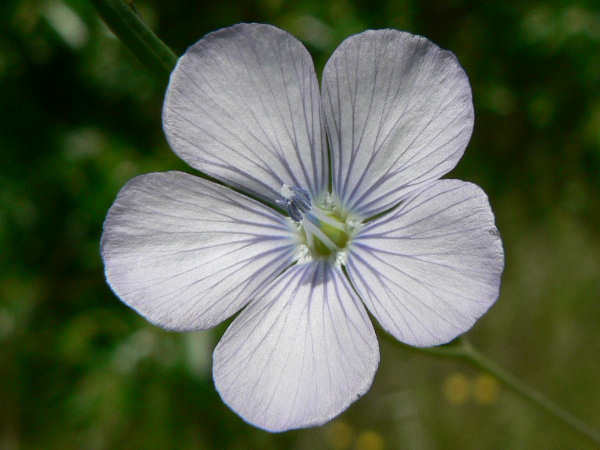 Many Americans rightly associate the genus Linum with the Flax family (Linaceae). A portion of the early American agriculture sector relied on commercial flax production to supply multiple markets including the linen market, paper market and oil seed market. Flax’s popularity remains equally high today, despite the fact the traditional flax industries, all sought flax alternatives. Small, in terms of its contribution to the total amount of oil seeds planted, flaxseed production finds life in niche markets such as wood products. Recent statistics from the United States Department of Agriculture show that in 2010, North Dakota farmers planted 390,000 of the total 421,000 acres devoted to the crop. Farmers in Minnesota, South Dakota and Montana account for the remainder of the production. Flaxseed and its derivative flaxseed oil/linseed oil are rich sources of the essential fatty acid alpha-linolenic acid, which is a biologic precursor to omega-3 fatty acids such as eicosapentaenoic acid. Although omega-3 fatty acids have been associated with improved cardiovascular outcomes, evidence from human trials is mixed regarding the efficacy of flaxseed products for coronary artery disease or hyperlipidemia. However, for any medicinal purpose other than as a laxative, the current state of the scientific literature remains unclear. Their commercial utility in multiple sectors of the economy, including agriculture, manufacturing and soil restoration, provides an opening for mustard plants in many daily conversations. 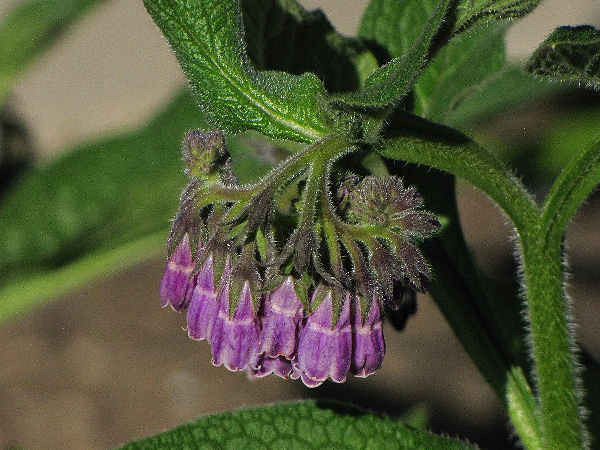 Flora of North America lists 634 North American species. The United States Department of Agriculture Plants Database records one hundred and seven genera highlights the expansive boundaries framing mustard conversations. 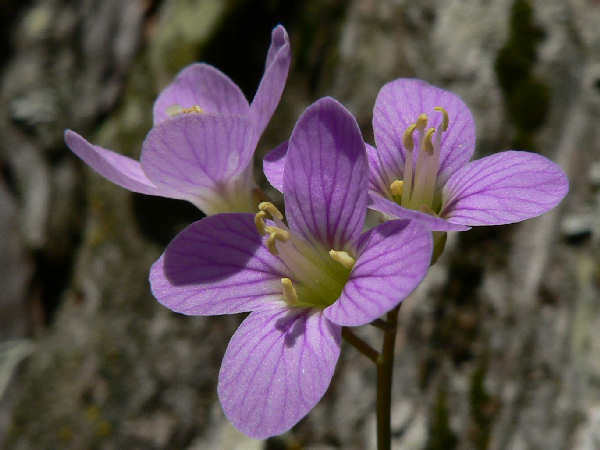 Nuttall’s Toothwort (Cardamine nuttallii) is an early blooming western native, it produces purple flowers, streaked with an additional dark purple color. Nuttall’s can be found in a variety of habitats, although it is commonly associated with riparian areas and forests. 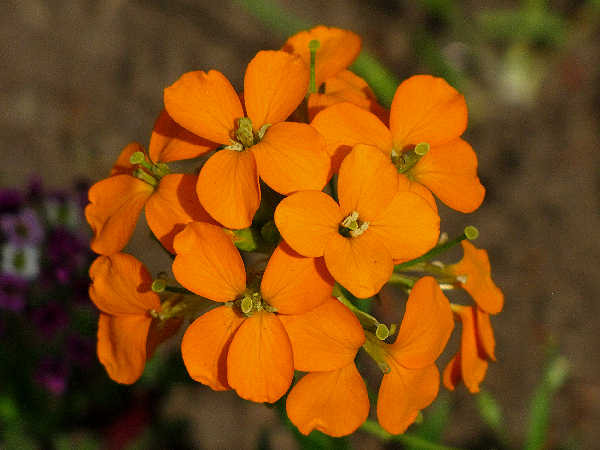 Both native and introduced wallflowers, genus Erysimum, are common spring blooming North American plants. The picture shows the orange petals of a sanddune wallflower (Erysimum capitatum), one of the most common native species. 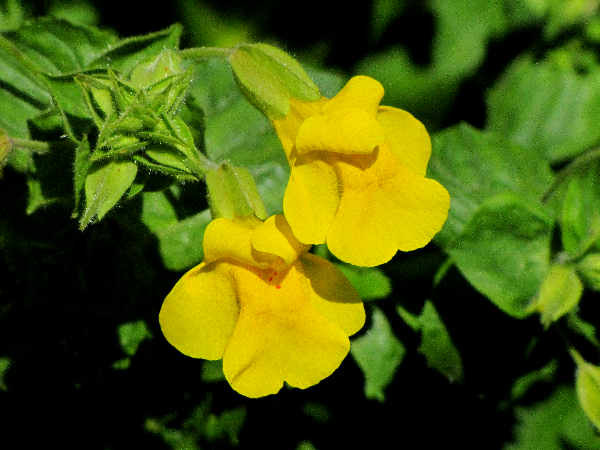 Of the ninety two species of Monkey Flowers (genus Mimulus), the vast majority grow in the West. Flower size tends to the small and smaller sizes, coinciding with plant size. Petal color differs from species to species. Colorful petals coupled with their adaptability to multiple North American ecosystems also makes Mimulus a popular garden plant. Most, if not all native mimulus species are characterized by petals with dual colors. The picture, for example, shows a yellow flower with red dots. Over one hundred Indian Paintbrush (Castilleja) grow in North America. While they do flower, their colorful bracts, or specialized leaves, show shades of red, yellow, orange and magenta. In large fields, Indian Paintbrush attract a variety of butterfly and hummingbird species. Unfortunately, their roots are parasitic on other plants, making them a poor choice for a cultivated garden. 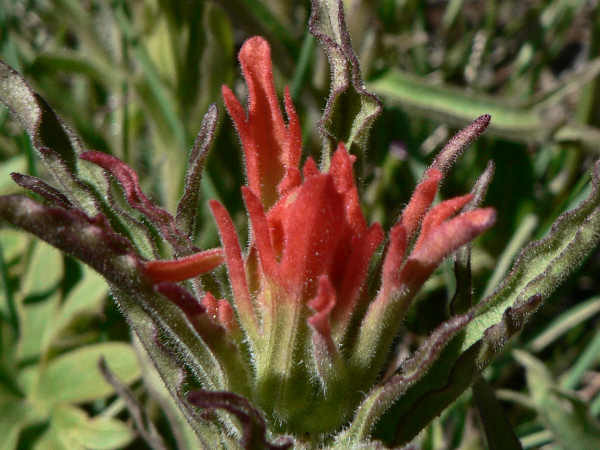 Wyoming calls the Indian Paintbrush (Castilleja linariaefolia) its official state flower. We expect our flowers to do little more than sit pretty in the soil, and for the most part, they oblige us. Then there are the flowers that break the traditional mold, adding an element of fancy to their beauty. In their effort to stake a claim in nutrient deficient areas, carnivorous plants succeeded in blending their meat eating habit with their flair for fashion. And, since the days when Darwin called them the “most wonderful plants”, interest in carnivorous plants has continued unabated. Droseraceae: The sundew family consists of two genera. About a dozen native sundew species (genus Drosera) have been identified. Look for them during the summer in sunny wetlands with acidic soils, their habitat of choice. The famous Venus Flytrap (Dionaea muscipula), the country’s only snap trap plant, grows in the Southeast. Lentibulariaceae: With a global distribution of over three hundred and twenty species, the bladderworts rank as the world’s largest carnivorous plant family. Two of the three genera, the butterworts (Pinguicula) and bladderworts (Utricularia) are common in the United States. 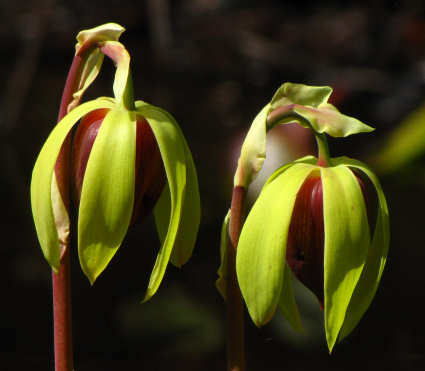 Sarraceniaceae: Two of the three genera of new world pitcher plants, Darlingtonia and Sarracenia grow in the United States. The top picture shows the flower of the Cobra Lily or California Pitcher Plant (Darlingtonia californica) the sole West Coast species. The bottom picture shows the plant’s cobra looking leaves. Approximately two dozen different Sarracenia species and hybrids, also called pitcher plants and trumpets grow mostly in the Southeast. With over thirty different species, covering all three families, the Southeast holds the title of carnivorous capital of the United States. Gardeners with a green thumb for bog plants easily grow most, if not all, of the species on windowsills and in backyard gardens.